When I first got back into reading as an adult, my go to reads were books by authors such as Jane Costello, Marian Keyes and Fiona Gibson who managed to get me looking like a loon laughing at the pages of the book. It was pure escapism being able to lose myself in the pages of a witty novel. Over the last few years there has been a huge gap in the market for comedic women's fiction and this is something that really needs to change. 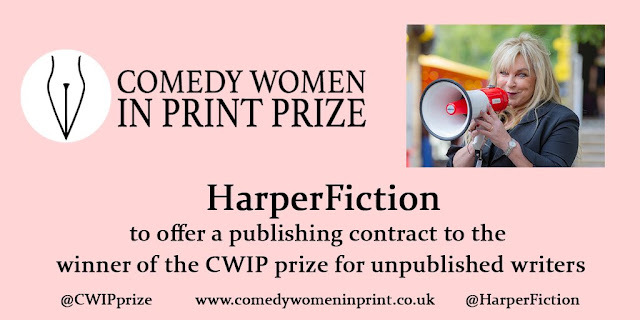 Someone else who thinks that we need more Comedy women authors to grace our shelves is the wonderful Helen Lederer and she has the most amazing opportunity to share with us for all of you budding comedic authors. If you have would like to have a chance to get your witty book into the big wide world then be sure to send your first two chapters in to Comedy Women In Print as you could win a publishing contract with the amazing publishing house Harper Fiction as well as a £5000 advance! Do not miss out on this rare opportunity, I look forward to shouting about the winders book on this blog I will be championing you as I am DESPERATE for more witty reads!